Wuthering Heights has been my favourite book since my high school days. We had one chapter of the story in our English syllabus and that got me to read the entire novel. I was unable to let this book down till the last page. The first time I read it, I felt very very uneasy for a few days. I would think of the characters and the relationships all the time and I was even beginning to dream of the English Moores! Written by Emily Bronte, this book is always compared to Jane Eyre written by her sister. I really do not know why as I just dont seem to see any similarity in them. 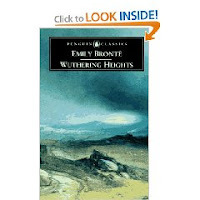 Wuthering Heights is an absolutely heart wrenching dark love story. You can hate and love the characters at the same time. The description of the moores and the 2 main houses (Wuthering Heights and Thrushcross Grange) in the story leave a lasting impression on you. The story takes you into different generations and at the end you really feel like you've traversed through time along with the protagonists. Catherine belongs to the Earnshaw family. Heathcliff, the central protagonist is an orphan brought into the family. Catherine and Heathcliff's relationship, their undisputed love for each other is soo well told, that it takes you to a totally different world altogether. Wuthering Heights is the name of the house they live in. Catherine betrays Heathcliff to marry Edgar from the Linton family for the sake of status and reputation. This breaks Heathcliff. The entire plot revolves around how he jumps back and the emotions within him that drive him to do crazy things. This lasts for the next 2 generations including Catherine's daughter. The best part of the book is that the Yorkshire lands create a haunting and mystic atmosphere which plays a major role in bringing life to the book. Ever since I read this, I have always dreamed of going to England and the moore lands. There is no thrill, mystery involved here. Its sheer dark romantic and frightful. The madness of Heathcliff and Catherine is etched out magnificiently. I loved the narrative form of the book and the way the events unfold. The entire story is told by Mrs Dean, Catherine's caretaker to Mr Lockwood who comes to stay at Thrushcross Grange. There are few character creations that make history. I believe Heathcliff is one of them. Full of flaws and circumstantial cruelty, he demands a place among other famous characters. This book is classic literature and definitely not worth missing. ...and then there were none!! This has no reference to any person or animal alive or dead. Hi. My name is Meena. I used to live with my sisters in a beautiful home beside a lake. My owner was a bad man. He would come drunk almost every other day and beat up his wife. They had a little daughter who was way too adorable. I could say she was my closest interaction with a human there! Every day, I would play with my sisters, be well fed and sleep well. Good days. All this came crashing down when slowly my sisters started disappearing. I was the youngest and well protected. When my eldest sister went missing, we all were shell shocked. We searched for her all over the place. Our friend, the owner's daughter also seemed to help us with the searching. But in vain. This continued to happen. We had lot of neighbours for company. They too complained of the same thing in their family. I was growing bigger and fatter, but things only got worse. Then came that one dreaded day!! One early morning, when I woke up, I saw myself and 10 others like me from different families being taken somewhere in a moving vehicle. Initially we thought it was a picnic. We were being taken out to the town for some sight seeing by our owner. We had heard of the high rise buildings and were enjoying the ride till it lasted. Talking and chatting, cracking jokes. After sometime, we were taken out of the vehicle and into a house like thing. We were stuffed into a small compartment and left their to rot for a long time. This has perhaps been my worst experience till date. It started getting stuffy, we were suffocating and were bored to death. Every morning, one of us was being removed. I do not know where and for what we were taken for. Rumour started to make the rounds...gruelling and disgusting stories were being told as to what seemed to be happening to the missing ones. I reminisced the beautiful times of the good old days. Our owner's daughter and my sisters, happily playing near the lake. Tears rolled down my eyes. This was perhaps the first time I missed my mother. I do not have any memories of her as she died before I could start recognising people and things. But somehow today, I was missing her and wished and prayed to god to save me and take to to where my mother was!! The door opened. We were 2 of us remaining in our room by now. The big man who would come everyday to pull one of us out came in, he looked at both of us with fiery eyes. I was sweating all over by now. His eyes were moving between me and my roommate. I tried to cross my fingers, clenched my teeth and closed my eyes. My worst fear came true that day. He selected me as the next victim!! I was dragged out. I screamed and made all kind of noises. Tried to hurt, kick and bite him. But he was too strong for me. I looked around desperately for help. I knew no one. All were strangers. I was then taken into a kitchen where more men were waiting. I was placed flat on a table and 2 men stared down at me. I screamed the loudest and with all my gut. One man took out a huge knife like thing and I saw it coming down on me with full gusto. PS: The story cannot proceed further as the chicken was killed to make a kabab. I watched Aamir’s Ghajini last evening. Nothing great. It was an average masala flick with lots of loop holes. Im really wondering what the whole hype and hoopla was all about. The only movie to have grossed the maximum on its first day of opening in the history of Indian cinema. Naah! Not happening…! I was debating whether to watch the original Memento first, but gave in to curiosity and lot of peer pressure. I had decided then that I will traverse in the reverse order. If this movie claimed to have taken care of the “mistakes” from the previous one, I wonder what the state of the other Ghajini was! Surprisingly, I think readers of my blog seem to like Surya’s Ghajini more (refer the poll stats). So, now, that’s irony. I now want to watch the other two movies out of curiosity again. The story line is straightforward and the theme pretty much common. A rich guy falls for a middle class girl next door. The girl is killed and the hero sets out for revenge. The only change there is the guy has short term amnesia and the weird way he sets himself up to remember the killer and finally take revenge. Its an interesting twist to the common base theme, no doubt. But, really, I would have expected an Aamir movie to have been made better. The things I liked about this movie ? Worth watching once if you’re an Aamir fan, haven’t watched the other originals or you have nothing better to do. Rating: 6 stars out of 5! Before I start to write anything at all about the movie, for those of you who haven’t watched it, please stop right here and get yourselves the DVD right away. The above words pretty much sum up what the movie is all about. My fascination for the movie started almost a decade ago. Each time I watch it, I end up crying at the end. The character of Forrest Gump is the most beautifully sketched one ever till date. The only other perfect character in recent times has been “The Joker”. This is the story of Forrest Gump portrayed so perfectly by Tom Hanks. It starts right from the time he’s a young boy till the time of his young boy. The different phases of his life- the first bus journey to school, his friendship with the (in)famous Jenny, his escape from the school bullies, his brush with President Kennedy, friendship with Bubba, adventures with Lieutenant Dan, the ping pong championship, the shrimp business, the famous free running, Jenny’s return, his son Jr Forrest …..a roller coaster of events all pieced together to form one of the most amazing movies I have ever seen so far. I seriously do not have more words to describe the movie. Watch it to feel it. Trust me, you’ll enjoy it! Here are some of the scenes (Well, its been a long time since I last watched it) and dialogues from the movie which one just cannot forget. Forrest and Jenny are walking back home from school. The big bullies of the school come chasing them. Forrest runs, he runs so wild that the braces on his legs come ripping apart. Forrest’s mother is on her death bed. She had got the cancer and died on a Tuesday. ….worth a zillion watches. And that’s all I have to say about that! My first post for this new year. And yes, its another clichéd one. But I really wanted to pen down those few moments of 2008 that have left a mark …. Job kinda was satisfying and the icing on the cake was my promotion. Amit’s grandmother passes away. A sad and painful loss…and a reminder of the losses Ive been through – losing both my grandfathers. A gala celebration as this was one of the last weddings in my group. Memorable. There is still another one to be completed this year! A sweet birthday and a sweeter surprise from my sweetheart! This was followed by a beautiful first year wedding anniversary celebration. The journey thus far has been absolutely fantabulous and a dreamy one at that! Relaxed and rejuvenated at Maldives…I seriously would call it heaven on Earth! Being a typical Cancerian, this had to have a mention in the events of the year. Our famous and loving Maruti 800 saw sun set. Dad sold it with a heavy heart. Two of my very close friends bid adieu as US and UK beckoned them. A last “Rachel” night out (those who’ve seen the episode in Friends where Rachel leaves to Paris, will understand) , tearful farewell et al. Guys, Bangalore rocks…so get you’re ***** here soon!!! This time in our Oni…superb fun and an exciting elephant encounter. I got to live life exactly like it used to be before the wedding (Well, not that it changed too much ) Stayed over at my parents place…err…my place for a good 2 months, thanks to the construction happening at my in-laws place. Felt wonderful getting back to “our” little den again. The cleaning, re-organising and re-furnishing was more fun this time around. This is definitely dedicated to my mother. I surprised her and even myself when I actually started to cook. A few dishes here and there and ta-da, a surprise packet. I finally learnt cooking! Its not rocket science but then for someone who didn’t even know how to make tea, I’ve surely come a long way…. The year for sure has been an eventful one. Just hoping for another wonderful 2009….cheers!